Brad Davis comes to town to show gut-tar players how it�s done. Fort Worth native Brad Davis has played with Marty Stuart, Earl Scruggs, Billy Bob Thornton, Steve Earle, Warren Zevon, and Willie � \r\nwhere�s he been hidin�? 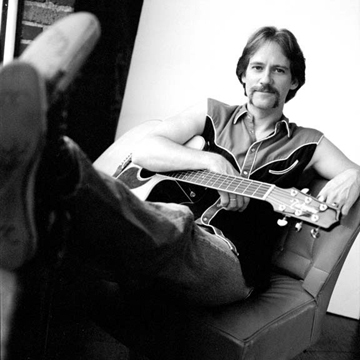 Few native sons have ridden their guitar as far as Brad Davis, who went from taking ax lessons in Fort Worth as a kid in the 1970s, to playing the Grapevine Opry in the 1980s with a bluegrass duo, to touring with the likes of Marty Stuart, Earl Scruggs, Billy Bob Thornton, and Sweethearts of the Rodeo, and recording with Steve Earle, Willie Nelson, and Warren Zevon. Hell, he�s been so busy for so long he even turned down a touring gig with the Dixie Chicks at the height of their fame in 2003. And anyone who thinks guitar pickers are lousy at bidness ain�t met Davis: He has a patent on a string-bending device for the guitar known as � what else? � the Brad Bender; he sells guitar instructional videos distributed by none other than Mel Bay; he travels the world as a guitar clinician for Takamine; and he�s a columnist for Flatpicking Guitar Magazine. The boy�s got skills. And he�s returning home to share his hot licks and songwriting techniques � and surely some war stories � in a laid-back coffee shop, and all for a good cause. Proceeds benefit the Fort Worth chapter of Nashville Songwriters Association International. Who knows, maybe Thornton will show up � Davis still plays electric guitar with the former husband of Angelina Jolie. Hey, you don�t suppose she will show up? Naaah. Davis recently decided to return to Texas after years of living in Nashville (although most of the past 20 years have been spent on tour). He shopped for a home in Fort Worth, but the cost of land was so high he decided to look elsewhere and ended up buying five acres in Commerce. He maintains a home in Nashville to flop at when he�s doing studio sessions, and he frequently flies to Los Angeles to gig with Thornton�s rock band, but in the future he plans to keep his boots planted most firmly in the Lone Star State, mainly to spend more time with his wife and two children. He is currently producing an acoustic Brad Paisley tribute album and a Tim McGraw tribute album at his 68-track recording studio in Commerce and producing a tv program called The Brad Davis Music Show, similar to Austin City Limits but unplugged and more conversational. Guests so far have included Thornton, Tommy Alverson, and Stephen Bruton. The show is set to air regularly in June on VSEN Network. He�ll also make regular trips to Fort Worth to host shows and guitar clinics at the Four Star Coffee Bar, where he envisions intimate monthly showcases similar to those at Nashville�s Bluebird Caf�. He�s even planning to give away a Takamine guitar at each show. �Maybe we�ll get a local radio station to broadcast it,� he said. Mostly, he�s thrilled to re-establish his roots. Seven degrees of separation between Davis and Tim McGraw � Only one degree required: Davis� �Ain�t No Angels� was included on McGraw�s 1993 debut album. Book larnin� � As a young man he took classes at Tarrant County Junior College and the University of North Texas but didn�t earn a degree. Minutia � Worked as a typesetter and designer at Fort Worth�s Weekly Livestock Reporter before heading to Nashville in the 1980s. Second Big Break � He was among 30 guitar pickers who auditioned to replace guitarist Ray Flacke in Marty Stuart�s band years ago. While some of the other guitarists were faster and more experienced than Davis, his open mindedness won the day. Stuart tested the guitarists by saying he planned to change his songs� keys to sharps or flats, something most pickers detest. �I thought, oh my God, this is going to be terrible,� Davis recalled. �But I told him, �This is your show and if you want to sharpen it a half step, I�ll do it.�� Stuart had no intention of playing the songs in sharps or flats; he was simply testing the musicians� malleability.